Aaron Harrison scored in Glassboro’s 7-0 victory over Gloucester on Wednesday. 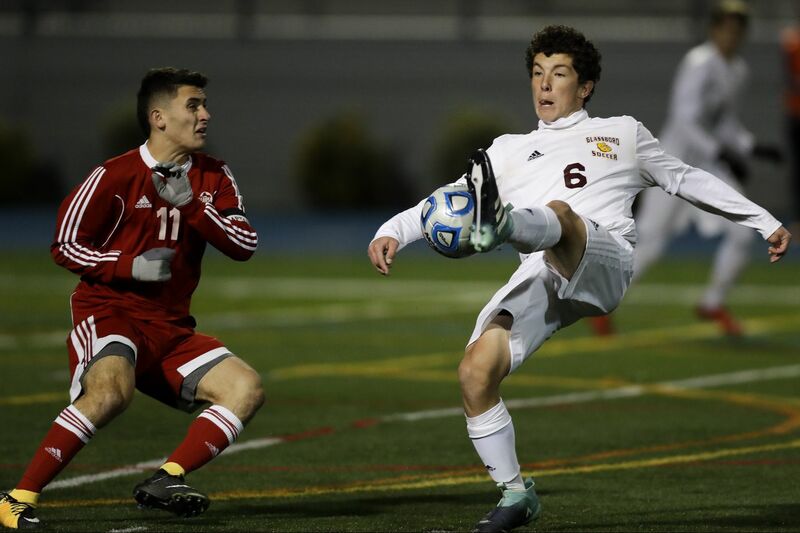 The Glassboro boys' soccer team blanked Gloucester, 7-0, on Wednesday. Luke Archibald, Cody Beato, Colin Bridges, Aaron Harrison, Santino Mancini, Gorkem Ozdemir and Justin Tongue scored one goal apiece. Millville rolled past Holy Spirit, 7-0. Matt Price had a hat trick, and William Muhlbaier and John Sheppard each added goals. Frankie Knapp had a hat trick as Delsea beat Hammonton, 3-2. Williamstown edged out Kingsway, 2-1, in overtime. Chris Jackson and Cullen Rutter added goals. Austin Carbone, Jake Ciurlino and Dylan Trow scored in Audubon's 3-0 win against Clayton. Dennis Olgun recorded 14 saves as Wildwood beat Gloucester Catholic, 2-1. Will Long and Tyler Tomlin scored one goal apiece. Pleasantville beat Buena, 4-0, thanks to goals from Melvin Casco-Quintina, Daniel Licona, Juan Perdomo and Manuel Ruiz. Jack Accorsi, Vincent Fedoryka, Jack McEvoy and Cody Scully scored in Cleaview's 4-0 win over the Gloucester Institute of Technology. Nick Razze recorded a hat trick in Pitman's 6-2 victory over Salem. Sean Fanelli had seven saves. Morrisville lost, 8-4, to Doane Academy. Nicklaude Saint-Juste and Levy Menjivar-Sanchez combined for six goals. Jordan Carty and Serena Garcia knocked in goals in Triton's 2-1 victory over Highland. Brianna Breen had 16 saves for the Mustangs. Clearview beat the Gloucester Institute of Technology, 7-1. Sydney Wurst knocked in two goals, and Mackenzie Clement, Julia Gehring, Jackie Norris and Emmy Sinnett scored one goal apiece. Hannah Cooskey and Kate Samuels scored in Pennsvillie's 4-2 win against Penns Grove. Kayla Rozanski's hat trick led Woodbury to a 3-2 victory over Clayton. Buena defeated Pleasantville, 5-0. Sophia Ridolfo recorded a hat trick and Evelyn Cruz and Maria Muzzarelli scored one goal apiece. Reese Whitley scored two goals in Pitman's 7-2 victory over Salem. Angelina Bluford, Emily Bohl, Madison Bridges, Olivia Van Mater and Juliana Villari each scored. Lauren Bone recorded two goals and one assist in Arthur P. Schalick's 5-1 win against Woodstown. Nya Salmon added two goals. Abbie Brown, Tori Griffiths and Morgan Klaiss scored in Kingsway's 3-0 win over Williamstown. Delsea blanked Hammonton, 10-0. Sierra Guiliano, Abby Hartwell, Dawn Lombardi and Madison Visalli scored two goals apiece. Deptford defeated Cumberland, 2-0, thanks to goals from Ashley Deluke and Regan McQuilkin. Allison Frampton and Sara Hussey each knocked in two goals as Gloucester Catholic beat Penns Grove, 8-0. Pitman defeated Salem, 4-1. Giovanna Laganella scored every Pitman goal.